Sluggish acceleration, hesitant shifting, strange noises, and a leaking pink or burnt brown fluid are all common signs of transmission trouble. A transmission relies on a complex series of mechanical parts and hydraulic and electronic controls to function efficiently, and one minor problem will eventually lead to series of larger issues down the road. For this reason, AAMCO certified technicians are trained to diagnose the source of transmission issues to ensure that you don't run into the same problems later on. Initial engagements for each gear. Drive range for each gear. Neutral, park, and reverse gears. 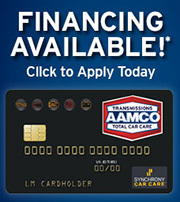 With AAMCO Transmissions and Total Car Care of Las Vegas, you can rest assured that we'll do everything necessary to provide an accurate and honest estimate of the repairs you need to get back on the road as cost-effectively as possible. That's why we have the confidence to stand behind all of our services with guaranteed warranty coverage. Modern have electronic diagnostic systems that automatically report engine or transmission troubles (i.e. your “Check Engine” light), but it still takes an experienced eye to spot the cause of electronic trouble codes. In addition to scanning computer trouble codes, we'll also use AAMCO's Kwiktest PlusBox and our proprietary technical database the largest source of transmission diagnostic information available anywhere to identify internal issues. In some cases, the computer hardware itself may be the source of performance issues. To ensure this isn't the case, our AAMCO master technicians will also assess the integrity of any sensors, wiring, and solenoids that could affect your car's performance. We here at AAMCO Transmissions and Total Car Care of Las Vegas have the experience and resources to go the extra mile and ensure that your car, truck, or SUV continues running efficiently for years. Independent shops and smaller auto repair chains simply can't compare to our level of service and coverage. In order to ensure that an AAMCO rebuilt transmission provides years of efficient performance, we only use high-quality components to ensure a solid repair. With an unfamiliar auto shop, you may get stuck with unskilled repair work or salvaged replacement parts and perhaps no warranty coverage to fix it. Our services encompass all makes and models, and our warranty coverage provides an extra level of security beyond reliable repairs. We not only take the stress out of searching for a reputable auto repair specialist, but we also take care of you long after you drive away.